Grazing BestPrac has collaborated with Multifarming Systems and Simplicity Air Seeders Australia to develop a cutting edge pasture planting unit that can assist landholders and rehabilitation services to regenerate degraded land. The 5 metre unit in this video is based in central Queensland, Australia and has the capacity to apply pasture seed, cereal seed, granular fertiliser and liquid fertiliser/ compost teas/ amendments all in a single pass. a BNS easyflow distribution head. It is essential to conduct soil nutrient analysis, microbial analysis and match nutrient requirements to balance the soil before planting seeds. This will guarantee success. For more information call Grazing BestPrac 0438 395 255. Watch the video of the "Pasture Kropper" in action. 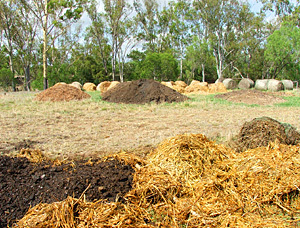 by farming such as husk, effluent, vegetable waste, stubble and so on can be used to produce compost. • Static Pile composting—slow (6 - 12 months) degradation of plant wastes—such as adding mulch to soil – can be used in the backyard or on-farm. • Aerated or Thermophilic composting— Generally this uses a compost turner to create rapid breakdown of organic material (6 – 10 weeks) where the compost pile gets hot and sterilises seed and pathogens. • encourages a wide range of soil organisms. Another big plus is to create a compost that is nutrient balanced to your soils. During the heating process, many nutrients can be added to the compost including – Nitrogen, Phosphorous, Sulphur, Potassium, trace minerals, fulvic acid, other food sources and clay products. windrow for commercial production. The key elements needed when making good thermophilic compost are described in the following section. To ensure air can move in the compost heap it is important to turn the pile regularly, allow air to flow around and throughout the pile and include a range of different sized and shaped materials. However, the large pieces of woody material will take much longer to break down than smaller ‘chips’. may need a water supply to keep moisture up to the pile. or manure) materials. Select the correct mix to give a carbon: nitrogen (C:N) ratio of about 30:1. You will need to ensure the temperature does not increase above 65 degrees centigrade. What happens during Composting? Click here.